Patented technology of today, to achieve an improved tomorrow. keep the appropriate scale/distances of the triage area, processing stations, beds, and waiting rooms easily and accurately ensuring that the travel distances for service providers as well as patients would be tracked for further layout analysis. 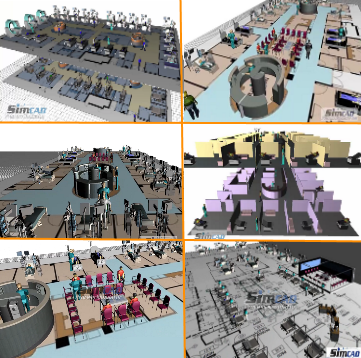 Creating the model was as simple as placing registration, triage, waiting room, etc… “processes” onto the Simcad Pro Health canvas and the “skeleton” (including both 2D and 3D animation) of the virtual ED was readily created, using the convenient drag and drop interface. Although we had the option to enter our model parameters (timings, capacities, buffers, resource requirements …) manually, we opted to dynamically import these items using the built-in Import/Export wizard which proved useful in saving valuable time while various scenarios where analyzed. Using actual historical data ensured that the natural affect of statistical distribution wouldn’t skew the data and add to the ever present variability that we were looking to mitigate. Once the process flow was mapped, historical data (including arrival rates) were imported, and we ran the model to ensure a valid flow and accurate results compared to historical data. Identifying the poorly performing areas of the ED was quickly determined by observing the visual back up of patients, and through several built in reports that could be accessed at anytime throughout (or after) the simulation run. (We found that the “Simulation Analysis Report “ was specifically useful as it provided a clear and concise view of the poorly performing areas for resources, processes and top level model activity of the ED). 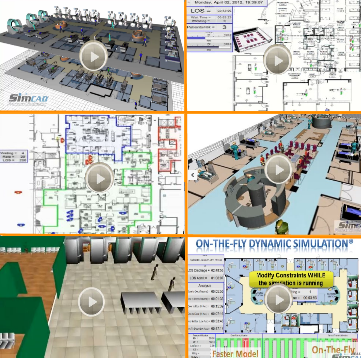 How to improve, optimize, and schedule in ED, ER, OR departments with On-The-Fly Interactive Dynamic Simulation.